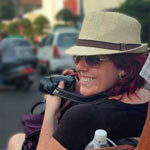 Meagan Collins, 30, is editor of the Five Dollar Traveller website and is originally from Australia. 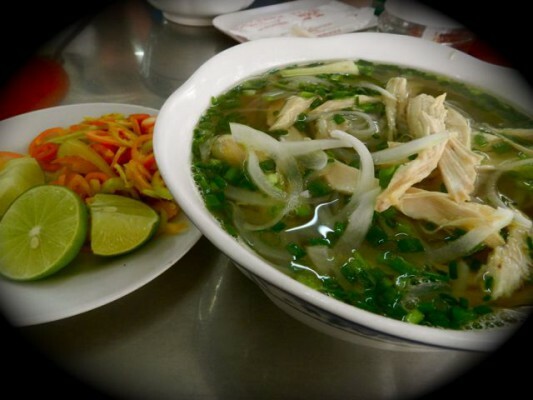 Here, she counts down some of her favourite Asian destinations for the best street food… it’s certainly made us hungry! The vast world of Asian street food is one that has the ability to fascinate and repel us all at the same time. We at Five Dollar Traveller are huge supporters of going out and trying everything we can possibly find that comes from a little street-side cart, on a stick or sometimes just in a tiny plastic bag. Asian street food is everywhere and here’s our countdown of the best cities to visit to find yourself a gastronomical treat! Singapore is known as a very clean city. Because of this you won’t see a lot of the ‘typical’ street food carts on the streets. 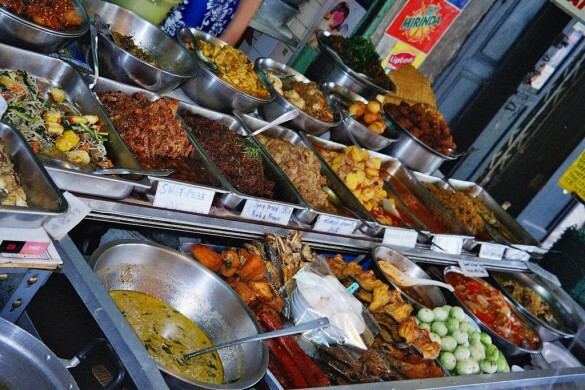 They do however have hawkers markets where you can find a selection of local specialties all in one place! Chicken and rice may seem boring – the choice of a traveller who’s ‘playing it safe’ food wise. But in Singapore this is not the case. Actually it’s practically a national dish which is found in stalls all over town and it’s delicious. 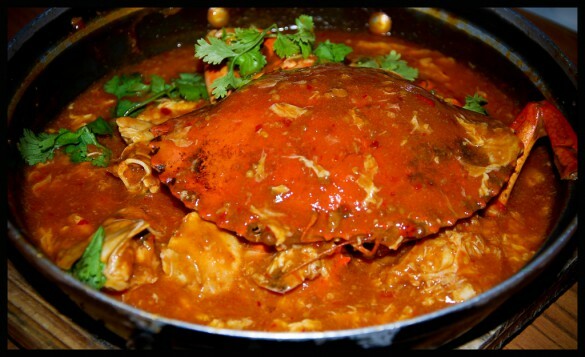 Also, if you spot chilli crab make sure you give it a try. Click here to see our Singapore hostels. This city is famous for its annual Ice Festival. It’s this event that usually attracts the crowds. But in the summer when all the snow and ice has melted away, the streets come alive. All you can smell is the aroma of cooking meat in the air. Yes, for a few months every year the locals hit the streets at night in search of tasty street BBQ, which is everywhere. All you do is grab a little basket (supplied) and fill it with everything you want cooked up. Choices range from the assortment of vegetables on sticks including coriander or enoki mushrooms wrapped in tofu, to the meat eater selection of pork, chicken and even whole BBQ fish. Served up with a cheap beer, this is a great place to try an assortment of Chinese food all on a stick. If you’re a little more daring, the BBQ bugs dipped in chili powder are quite a popular treat. Click here for hostels in Harbin. 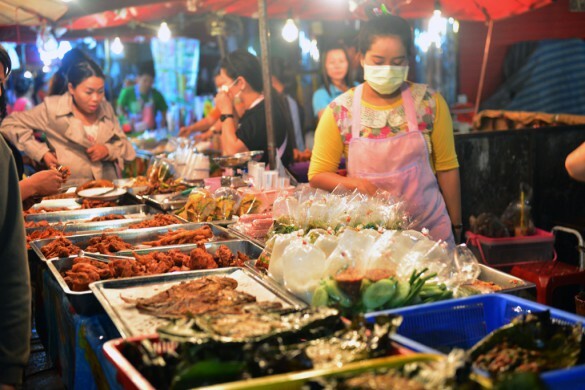 Chiang Mai is becoming world-renown for their weekend street market where it seems that thousands of vendors and consumers come together in a shopping frenzy. In between the paintings and souvenir gaff there’s some amazing street food to be found. We spent hours just roaming around grazing on local treats as we went. Some of the best were fresh hand-pulled noodle soup, banana waffles, tofu on a stick and some not-so-good-for-the-waistline, but tasty, fried chicken. There are also quite a few stalls offering an assortment of fried bugs to tantalise your taste buds including silk worm, cricket, cicada and the always-delectable grasshopper. 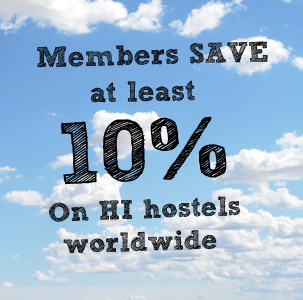 Click here to check out our Chiang Mai hostels. Ok ok we get that Thai food is legendary! And no matter where you travel you’ll find some incredible food to satisfy even the fussiest of travellers. Everyone loves Thai food right? If you make a trip to the popular tourist area of Khao San Road the street food selection is more palatable to the everyday traveller. Here you can find kebabs; rotti (Indian pancake) with a choice of banana, egg or Nutella filling all smothered in condensed milk; and of course the famous pad Thai. All of this is well and good but if you want some exceptional street food then we recommend you head to Chinatown. Once the weekend comes around the streets are overflowing with vendors selling so many delicious looking treats you won’t know what to eat first. We recommend tracking down some roasted duck or BBQ pork, and for desert, a custard-filled steamed bun. Click here to browse our Bangkok hostels. If you want to try street food so out of this world the mere memory of it has you instantly salivating, then head to Penang, Malaysia. Penang’s reputation for incredible street food has been noted as one to possibly overtake Thailand, and we totally agree! You won’t find little street carts here but hawkers markets. The markets, which can be found all over town, offer a fascinating selection of local delicacies. There is certainly something for everybody. We found the vendors to be incredibly friendly and more than happy to explain what many of the dishes are – a few contain congealed blood, watch out for that if you’re squeamish! 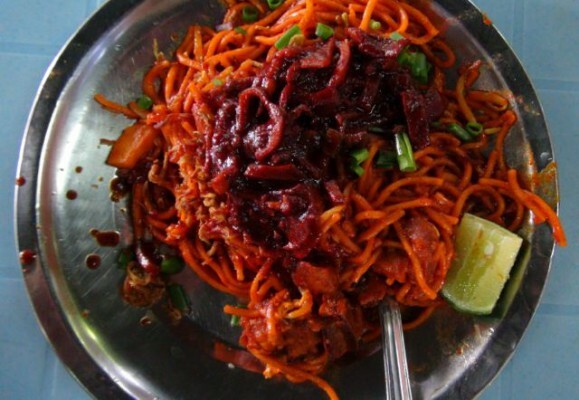 Some of our favourites include Chee Chong Fun, Char Koay Teow and Hokkien Mee and the famous Mee Sotong. Click here to peruse our Penang hostels. In many towns around the Philippines you’ll see rotisserie style chicken everywhere. But it was in the tiny town of Oslob that we found the best roast chicken we’ve ever tasted! The chooks (or, chicken for non-Aussies) are slow cooked over charcoals to a juicy, delectable perfection and then served whole for only 4USD. This dish, known as lechon manok is commonly eaten with bare hands and served with sides of chili vinegar, a slice of calamansi – a small fruit that looks like lime but taste more like orange – and a light soy sauce. Whatever combination you use is entirely up to you, but be careful! This meal may rock your world and you’ll never be able to look at roast chicken the same again. Click here to find out about hostels in the Philippines. Meagen Collins is chief editor of the Five Dollar Traveller website and author of Budget Burma: A comprehensive budget travel guide for Myanmar. While digesting her frequent food babies, Megsy blogs about tasty bites, booze, travel and whatever random topics pop into her head along the way! Follow Megsy on Facebook, Pinterest or Google+. Travel around the world with your taste buds! Looking for more gastronomic inspiration? 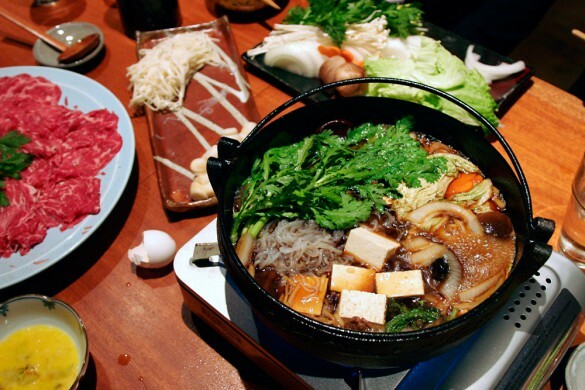 Check out Travel around the world with your taste buds!